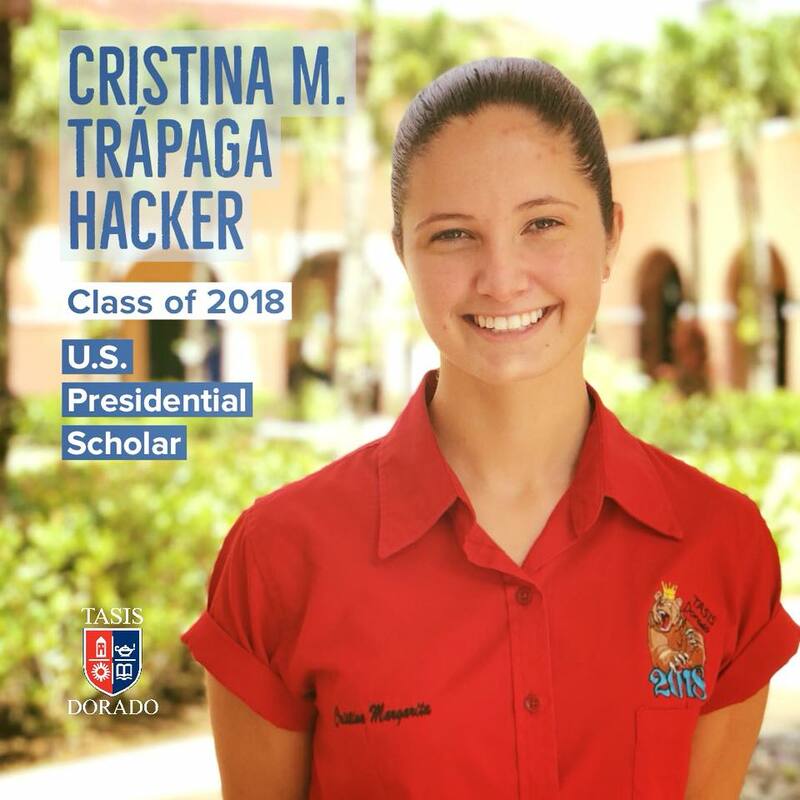 U.S. Secretary of Education Betsy DeVos today announced the selection of Cristina Trápaga of Dorado, Puerto Rico, who attends TASIS School in Dorado in Dorado, as a 2018 U.S. Presidential Scholar. Trápaga is one of 161 outstanding American high school seniors who have demonstrated outstanding academic achievement, artistic excellence, leadership, citizenship, service, and contribution to school and community. The U.S. Presidential Scholars will be honored for their accomplishments in Washington D.C., from June 24-26. "I want to congratulate this year's class of Presidential Scholars on their achievement and also thank their parents, teachers and other academic advisors who have helped guide them along the way," said U.S. Secretary of Education Betsy DeVos. "These students have pushed themselves to be the best they can be, and I am certain that devotion will serve them well as they continue their individual learning journeys." The White House Commission on Presidential Scholars selects honored scholars annually based on their academic success, artistic excellence, essays, school evaluations and transcripts, as well as evidence of community service, leadership, and demonstrated commitment to high ideals. Of the 3.6 million students expected to graduate from high school this year, more than 5,200 candidates qualified for the 2018 awards determined by outstanding performance on the College Board SAT and ACT exams, and through nominations made by Chief State School Officers, other partner recognition organizations or the National YoungArts Foundation's nationwide YoungArts™ competition. The 2018 U.S. Presidential Scholars are comprised of one young man and one young woman from each state, the District of Columbia and Puerto Rico, and from U.S. families living abroad, as well as 15 chosen at-large, 20 U.S. Presidential Scholars in the Arts, and 20 U.S. Presidential Scholars in Career and Technical Education. ceremony in D.C. The program was expanded in 1979 to recognize students who demonstrate exceptional talent in the visual, literary and performing arts. In 2015, the program was again extended to recognize students who demonstrate ability and accomplishment in career and technical education fields. Since 1983, each U.S. Presidential Scholar has been offered the opportunity to name his or her most influential teacher. Each distinguished teacher is honored with a personal letter from the Secretary of Education. The teacher chosen for recognition by Trápaga was Denisse Cintrón of TASIS School in Dorado in Dorado, PR. NOTE TO EDITORS: A complete list of 2018 U.S. Presidential Scholars is available at http://www.ed.gov/programs/psp/awards.html.